Pathfinder Fellowship, Consortium of Universities for the Advancement of Hydrologic Science, Inc (CUAHSI), $2590, Summer 2018. NCAR RAL Diversity Funding, $9830, Summer 2018. USGIF Doctoral Scholarship, $5000, 2018-2019. Hexagon Geospatial Student Mapping Application Award at USGIF GEOINT 2018, April 2018. Academic Enrichment Award, PSU Department of Geography, $950, Spring 2018. USGIF GEOINT Symposium Student Assistant, $500, April 2018. George Schenck 2018 Teaching Assistant of the Year Award, PSU College of Earth and Mineral Sciences, $1500, Spring 2018. Outstanding Graduate Teaching Assistant Award, PSU Department of Geography, $500, Spring 2018. Miller Award in Geography, Ph.D Paper, 1st place, $800, June 2018. Postdoc-Facilitated Innovation through Collaboration. Penn State College of Earth and Mineral Sciences, $50,000, Spring 2018. Deike Research Award. Penn State College of Earth and Mineral Sciences, Spring 2018. George Schenck Teaching Assistant of the Year Award. Penn State College of Earth and Mineral Sciences, Spring 2018. Scholarship to attend EnergyPath 2018, July 2018. PSU Geography Department Academic Enrichment Award funded by Ruby S. Miller Endowment for Geographic Excellence, December 2017. AGU Fall Meeting Student Travel Grant. AGU Earth and Space Science Informatics Focus Group, December 2017. Gold prize paper award in Young Scientists Session, Dimensions of Disaster Risk Reduction and Societal Resilience in a Complex World, The English Conference of the International Society for Integrated Disaster Risk Management, August 2017. NVIDIA GPU Grant, NVIDIA Awarded one Titan X Pascal GPU card. Basic research project entitled "Computationally Efficient Uncertainty Assessment for Environmental Parameters" has been funded by the Engineer Research and Development Center for year 2017 - 2019, October 2017. NASA Pennsylvania Space Grant Graduate Fellowship, $5,000, Fall 2017 and Spring 2018. Santa Fe Institute (SFI) Graduate Workshop in Computational Social Science funding from IGERT and SFI totaling, $2,475, June 2017. Outstanding Graduate Research Assistant Award. PSU Geography Department Academic Enrichment Award funded by Ruby S. Miller Endowment for Geographic Excellence. Ronald F. Abler Award in Geography, Spring 2017. Pennsylvania State University Global Programs Graduate Student Travel Grant, $750, May 2017. PSU Miller Graduate Student Fellowship Award for best Master’s Paper. April 2017. Warner Internship for Scientific Enrichment (WISE) Scholarship: Received the WISE scholarship to develop educational materials and provide interactive teaching on the analog ensemble technique, $2,500, March 2017. American Meteorological Society (AMS) Student Travel funding, $200, January 2017. National Center for Atmospheric Research (NCAR) Advanced Study Program (ASP) Graduate Student Visitor Program: Ms. Clemente-Harding received the opportunity to visit NCAR for a 6-month collaborative visit to work with leading scientists at NCAR. January 2017. PSU Geography Department Academic Enrichment Award funded by Ruby S. Miller Endowment for Geographic Excellence and Ronald F. Abler Award in Geography, $500, December 2016. Best poster in Research Penn State 2016 Institute for CyberScience Poster Competition, October 2016. NSF CyberCorps: Scholarship for Service Fellowship, 34,000 per semester for Fall 2016 - Spring 2018. Academic Enrichment Award from Ruby S. Miller Endowment for Geographic Excellence, $300, Spring 2016. Academic Enrichment Award from Ronald F. Abler Award in Geography, $150, Spring 2016. Travel award from ACM SIGSPATIAL, $800, November 2015. NSF funded Big Data Social Science IGERT Traineeship for 2015-2017, $100,000, September 2015. Academic Enrichment Award from The Rodney Erickson Fund in Geography, $300, September 2015. Student research award for University Consortium for Geographic Information Science (UCGIS), $400, May 2015. Academic Enrichment Award from The Rodney Erickson Fund in Geography, $200, April 2015. Academic Enrichment Award from The H. Herbert and Mary B Hughes Fund in the College of Earth and Mineral Sciences, $100, April 2015. EMS Centennial Travel Award, $1000, April 2015. Student’s research will help predict ozone air quality in Philadelphia. 1st place winner of the AI Student awards competition for oral presentations, $200, January 2015. EMS NSF Graduate Fellowship Application Incentive Award, $2000, ($1000 each), November 2014. National Science Foundation CyberGIS Fellow with the National Center for Supercomputing Appications (NCSA), University of Illinois at Urbana Champaign, $5,200, June 2014. 2014 - 2015: NASA Space Grant Scholarship for the use of UAVs and Social Media to assess environmental hazards around State College, $4,000, May 2014. 2014: Italian-American Young Investigator in Physics Fund, $1,000, April 2014. 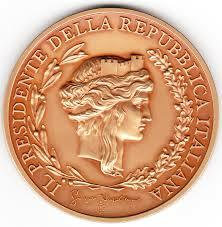 Medaglia di Rappresentanza del Presidente Della Repubblica Italiana, $5000, November 2013.